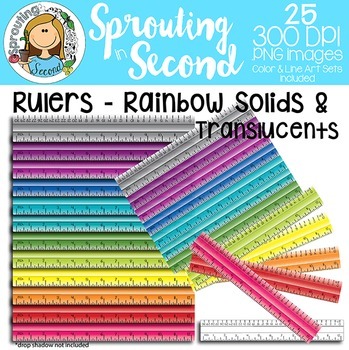 This set includes 25 high quality, 300 DPI, .png images - 2 sets of 12 double-sided rulers in a rainbow of colors, and 3D in appearance. One set is solid color. The other is translucent. One image as black/white line art is included. Colors included are: pink, red, orange, yellow, lime, green, blue-green, light blue, royal blue, two shades of purple, and gray. These rulers measure to 1/8th inch accuracy and include centimeters on the opposite side. My TOU require commercial users to include my store logo in any commercial products including my clipart. You may not alter my clipart except in specific instances. With this ruler clipart, commercial users may use a portion of a ruler in curriculum products where it is necessary to illustrate the size of an object in inches or centimeters. For example, instead of using an entire ruler on a page in a commercial product, commercial users may use a fraction of a ruler (e.g. inches 1-4) next to another object to illustrate said object's size to a student. Commercial users may not alter the color or add text to my rulers because this will change their original look, which is designed by me, and will also breach licensing terms. Please contact me with questions or special requests at sproutinginsecond@gmail.com, or on my Q&A tab. I appreciate your business and sincerely hope that my mathematics clipart benefits your commercial and personal endeavors.